Iran's Mahmoud Ahmadinejad says the leak is "propaganda"
(CNN) -- China's changing views of North Korea stood out in the latest round of sensitive U.S. documents dumps from whistleblower website WikiLeaks, with the material hitting the internet in Asia's predawn hours. South Korea's then-vice foreign minister, Chun Yung-woo, said earlier this year that senior Chinese officials (whose names are redacted in the cables) had told him they believed Korea should be reunified under Seoul's control, and that this view was gaining ground with the leadership in Beijing, according to the cables obtained by WikiLeaks. Another cable, from the U.S. ambassador to Kazakhstan, Richard Hoagland, in June 2009 said that the Chinese envoy there was "genuinely concerned by North Korea's recent nuclear missile tests," and saw its nuclear activity a 'threat to the whole world's security.'" Hoagland reported that China's objectives were "to ensure they [North Korean leaders] honor their commitments on non-proliferation, maintain stability, and 'don't drive [Kim Jong-il] mad.'" The full set of documents includes 251,288 cables sent by American diplomats between the end of 1966 and February 2010, WikiLeaks said in a statement announcing the release. Of those, 8,017 originated from the office of the secretary of state, and more than 15,600 are classified as secret, WikiLeaks said. CNN has viewed the cables posted on the websites of newspapers that received the documents in advance, and on the WikiLeaks website. The documents caused ripples of discontent around the globe, especially in Washington, where Secretary of State Hillary Clinton called "the disclosure ... not just an attack on America's foreign policy. "It is an attack on the international community, the alliances and partnerships, the conventions and negotiations that safeguard global security and advance economic prosperity," she said. Other released documents revealed that China, through both official and non-official channels, has played a critical role in U.S. policy toward Iran since President Barack Obama came into office. Xu Wei, a diplomat in the Iran division of the Chinese foreign ministry, told a U.S. political officer in March of 2009 that Beijing was hoping for "more clarity from the United States." Xu expressed the hope that Washington's Iran policy review would lead to direct talks between Iran and the United States. He also offered the Chinese government's assistance in creating a channel of communications between Washington and Tehran. At the same time, Xu said China was encouraging Iran to engage with the United States, but warned the U.S. diplomat that talks with the Iranians would require patience. Still more documents revealed the difficulty the United States found in relocating 17 Chinese Muslim Uyghurs detained at Guantanamo Bay. Beijing, which wanted the detainees returned to China, threatened reprisals against countries that took in the Uyghurs, according to the leaked documents. The United States, fearing reprisals against the detainees in China, eventually settled them in Palau, Bermuda, Albania and Switzerland. Earlier in the day, American allies slammed the leak -- or said they would have no effect on relations -- while one of Washington's loudest critics mocked them. Iranian President Mahmoud Ahmadinejad compared the release to "psychological warfare and a propaganda game. "These games will not affect relations," he told a news conference in Tehran, calling the documents "valueless." But a former top Israeli diplomat said that in fact the documents show Arab nations share Israel's concerns about Iran. "It's unfortunate that Israel's assessments on Iran were not taken more seriously," Dore Gold, a former top Israeli diplomat, told CNN. "Certainly I think ironically, Arab states and Israel had a very similar view -- both saw Iran as the primary threat to the Middle East region." Gold said the leaks could ramp up tension between two of the region's strongest powers, Saudi Arabia and Iran, who have an antagonistic relationship. "One of the big questions is how Iran responds to the revelations about Saudi Arabia," he said. "It's no secret in Tehran that the Saudis would like to see Iran put in its place, but when the views of (Saudi) King Abdullah come out openly about cutting off the head of the snake, the question is whether Iran lets that go by or whether they have to respond." The Saudi remarks come from an April 2008 cable to Washington from the U.S. Embassy in Riyadh. Saudi Arabia's Foreign Ministry spokesman, Usama Al-Nugali, said: "The documents do not concern the Kingdom of Saudi Arabia. Nor did the Kingdom have any role in producing them. Nor is it aware of their authenticity. Therefore, Saudi Arabia cannot comment on them. The Kingdom's policies and positions have always been clear." The British Foreign Office, for its part, Monday condemned any release of classified documents. "They can damage national security, are not in the national interest and, as the U.S. [has] said, may put lives at risk," the office said in a statement. Likewise, Jordan's official new agency, Petra, quoted an unidentified government source as saying documents referring to Jordan "reflect the analyses and readings of U.S. officials," and cover Jordanian positions "already made clear by His Majesty King Abdullah II." Leaked diplomatic cables dispatched from the United States embassy in Berlin, meanwhile, offered a series of blunt assessments of some of Germany's leading politicians. In a cable, written on September 18, 2009, some tart observations are given on the man who would shortly become Germany's foreign minister, Guido Westerwelle. He is described as having a "strong craving for political power" and as someone who "harbors resentment that he has not been taken more seriously by the Washington political establishment." Westerwelle denied the leaks would affect relations with Washington. "We work closely as friends with the U.S., and it will stay that way," he said Monday. A spokesman for Russian Prime Minister Vladimir Putin said it was premature to comment on the U.S. evaluations and descriptions of Russia and Putin revealed by WikiLeaks. "Frankly, I have yet to see the original texts of those [diplomatic] telegrams. I've only seen little excerpts published by a number of outlets, and short summaries," said Putin's press secretary Dmitry Peskov. "Before making judgments or comments one should see the original text, see who wrote what and to whom, and under what circumstances. Then one can make any judgments." But headlines around the globe described the possible impact of the latest WikiLeaks release. "Documents That Shook the World," Turkish newspaper Cumhuriyet said. Another Turkish paper, Aksam, referred to the documents as "The September 11 of Diplomacy." Turkish Prime Minister Recep Tayyip Erdogan said he would wait to find out what information the organization has before announcing his reaction. "Let's see first what WikiLeaks has at this stage. Then we can find out how serious or not serious these are. Because the seriousness of WikiLeaks is suspicious," he said Monday morning. Egyptian officials told CNN they were considering their response. Dmitry Peskov, a spokesman for Russia's Putin, told CNN that Russian officials were still going through the released material. "So far, we don't have much of a reaction," he said, adding, "we don't want to be involved in sensationalism." U.S. diplomats, meanwhile, tell CNN they do not believe there is anything in the released cables likely to cause lasting damage to Washington's relations with Moscow. 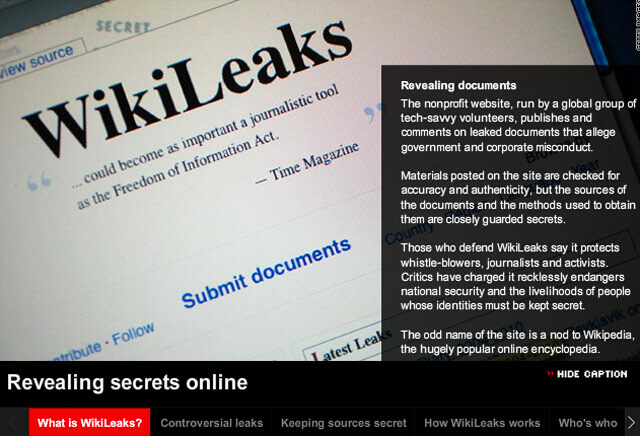 WikiLeaks has said the documents will be released in stages "over the next few months" to allow readers to digest them. White House spokesman Robert Gibbs condemned the release Sunday, warning that publishing the documents would jeopardize "our diplomats, intelligence professionals and people around the world who come to the United States for assistance in promoting democracy and open government." CNN's Kevin Flower, Diana Magnay, Matthew Chance, Yesim Comert, Reza Sayah, Samson Desta, Antonia Mortensen, Ben Wedeman and Yousuf Basil contributed to this report.